The next voice on the line suggested I had called the wrong number, and gave me another. The domino made contact with its neighbor. On calling this number, I immediately realized it was for Andersen directly, even though the firm keeps Renewal separate from an operational standpoint. I could sense the lean of domino two. As it fell, I was directed back to Renewal, at a third number. The pleasant woman who took my call informed me that she was at a national call center and it would require my local service center to schedule an appointment. After providing my zip code, she gave me a number to call. While hanging up to prepare to dial for a fourth time, I realized she had given me the number dialed for call number one. The only choice was to dial and tip the next domino. As I explained this process to yet another pleasant receptionist, she stopped the inertia. She asked for my first name. In that instant she made the conversation personal. Not my first and last name to look up my account, but my conversational identity. Then she asked for my phone number to verify my account and address, and asked to put me on hold while she contacted service. I was on hold for a little bit. About the time I was ready to set my stopwatch, a new voice greeted me. This service scheduler acknowledged that the receptionist had explained my circular experience. More importantly, she had already arranged to have someone come to my home the next morning – if that was convenient for me. She told me his first name, Lee. Lee was scheduled to visit Mike’s home and solve the problem. No more unstable dominoes. This scenario exhibits a couple of management issues that significantly impact communication, marketing and branding issues. First, one poorly trained intermediary at the lowest level of the business can create poor customer relations. The second issue stems from training also, but represents something cultural as well. It’s empowerment. When the lowly receptionist has been empowered to take action and intervene on behalf of the customer, the role becomes more significant. When the first line of contact is not just trained to be a pleasant gatekeeper, but is prepared and encouraged to act, the customer feels valued, acknowledged, and potentially most important, justified that the purchase decision was wise. In a world of automated call servers, the human who asks my name (even if I can’t recall hers) and solves my issue, sets the brand apart. Plus, notice the number of humans to whom I spoke in the course of five minutes. 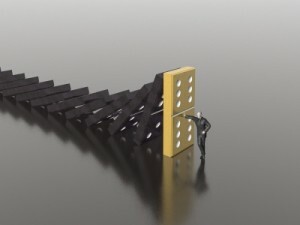 It is not how the first domino falls for the customer that solidifies the perception of the firm and product, but how the last domino ends up.